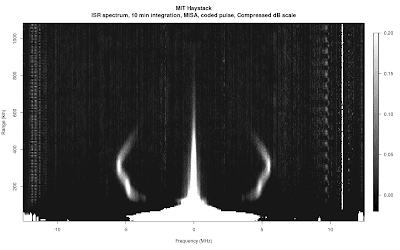 On Wednesday we did a short one hour test run to see if MISA can detect a plasma line profile too. And yes, we can also see a plasma line profile with MISA too!. Here is a correlation estimate of the spectrum for a coded pulse experiment. 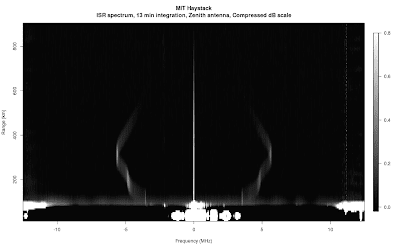 MISA plasma line profile extending all the way down to the E-region. Notice that with the coded pulse, the range ambiguities and self-noise is a bit different from an uncoded pulse. In addition to that, I've been trying to figure out different time and frequency domain processing tricks to remove RFI from our measurements. Our situation here is pretty dire. If we just do simple incoherent averaging our our data, this is what we get. I actually had to compress the dB scale a bit, because the interferer at about +3 MHz was swamping everything else, including the ion line. 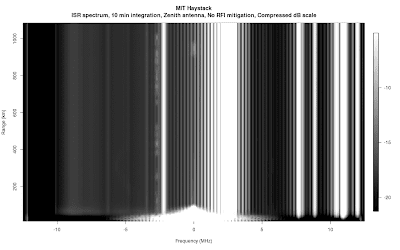 ISR spectrum without time or frequency domain RFI mitigation. However, after careful RFI filtering, we can get something like this, where we can trace the plasma line all the way from the E-region peak to 600 km. 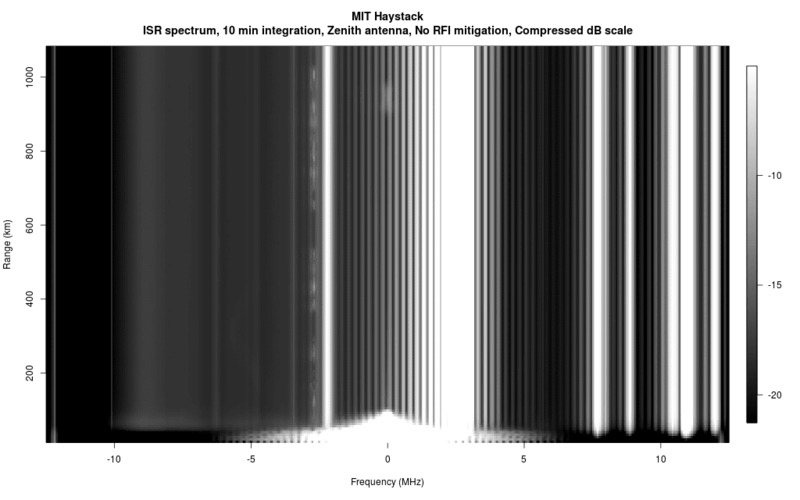 ISR spectrum with time and frequency domain RFI mitigation. The next logical step is to do a full-profile inversion of the electron density and use that as a guess of where the plasma line is, in order to do a lag-profile inversion on the plasma-line. Having a very accurate electron density profile will certainly help in nailing down some of the plasma parameters too.